Nearly 7 million vehicles have been recalled by General Motors. That’s almost as many automobiles and trucks it has recalled in the U.S. over the last 4 years, combined. This number of recalls does include Canada and Mexico as well as cars and trucks exported outside of North America that needed to be repaired or recalled. The latest recall was on Monday when General Motors recalled 1.3 million vehicles, mostly in the U.S., to fix a problem in power steering. To cover the cost of all the repairs GM said it will take a $750 million dollar charge against earnings in the first three months of the year. This is an increase from its earlier estimate of $300 million. GM took a hit as its shares are off 16 percent so far this year. This year’s batch of recalls is by far the greatest number by GM in a long time. In 2010 it recalled 4 million vehicles in the United States which was the highest total in recent years. Last year’s recalls were lower at 1.6 million. 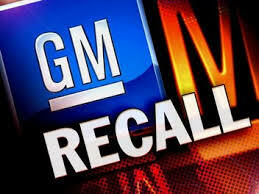 What is The GM Recall For? A defective ignition switch, which could shut off the car while driving and disable not only the car but when the engine is off the power steering is disabled and electrical power to the air bag and anti-lock brakes are disabled. With these systems not operating it can result in a serious car accident and death. General Motors is taking a lot of heat as to why it took 10 years between the time it discovered a problem with an ignition switch and its decision to recall 2.6 million of the small cars earlier this year. If you or someone you know owns a model year 2004-2006 and 2008-2009 Chevrolet Malibu, 2004-2006 Malibu Maxx, 2009-2010 HHR (non-turbo), 2010 Cobalt, 2008-2009 Saturn Aura and 2004-2007 Ion, and 2005-2009 Pontiac G6, you should contact a local GM dealer to verify if your vehicle falls under this recall. In the affected vehicles, there may be a sudden loss of electric power steering (EPS) assist that could occur at any time while driving. If you have been injured in an auto accident from one of these vehicles, then you should contact a NH auto accident attorney to see if you are entitled to compensation. The company confirmed that Mary Barra, (CEO of General Motors) met with some of the families of people killed in those cars at the company’s Washington, D.C., offices Monday night. Barra faces two days of testimony before House and Senate panels Tuesday and Wednesday. In remarks released in advance she apologized again for the problem and the delay in fixing it, and conceded the company still does not know why the recall wasn’t made much earlier. GM also is due to report March U.S. auto sales Tuesday, along with the rest of the industry. With all the recalls going on with GM, experts forecast that the company will post a slight increase in sales compared to last year, but not as much of a rise as the industry as a whole. The company announced early Tuesday that it would have to delay the release of its sales report by several hours. The reason: problems with the computer system dealers use to report results.